This was first shared with me by Shameeka Ayers of The Broke Socialite. So I’m paying it forward and sharing it with all of you. You must print this out now and hang it where you can see it every day. 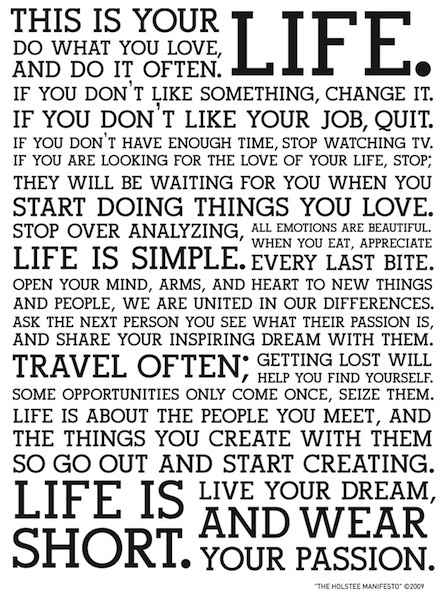 This is the Holstee Manifesto from clothing and accessories designer and curator Holstee. This is terrific. I’m going to pay it forward too! Thanks. Great post and very inspiring manifesto! I’ve printed it out and put near my desk at work. Good thing to read every day!